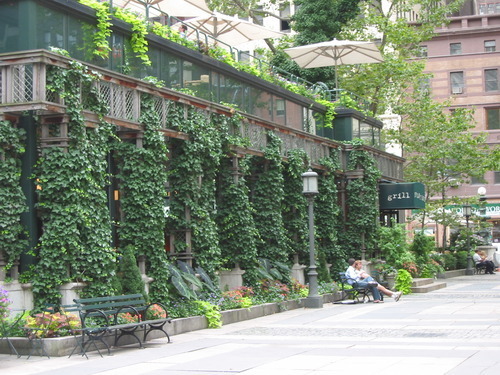 The Bryant Park Grill is a great excuse to visit the park if the winter blues have been keeping you away. Located behind the New York Public Library at the Southeast corner of the park, the Grill serves brunch, lunch, and dinner in a sophisticated dining room and boasts a beautiful bar area. The menu is full of delicious winter dishes to help tide you over until Spring. Offerings include Cauliflower and Butternut Squash Chowder, Crispy Duck Confit and Asparagus Salad, and Jumbo Lump Crabcakes, to name a few. End the meal with a divine dessert like Creme Brulee or Peach Upside Down Cake, by chef Anne-Marie (who created an adorable cake last summer for our 75th Anniversary Celebration of the park’s London Plane Trees). If that isn’t enticing enough, many movies, including 2009 hits Julie & Julia and It’s Complicated, have filmed scenes at the Grill and it’s not uncommon to spot a celebrity dining a few tables away. Visit the Bryant Park Grill website for the full menu as well as hours and information. Special menu items are frequently posted to the restaurant’s Facebook page and Twitter feed. Could you share where one could purchase the same, large round planters you have in the park? We want to try and copy the "stacked" planter design you have (we love the park so...). Would be so happy if you could direct us. Hi Jack - I'll send you an email and put you in touch with our horticulturalist.